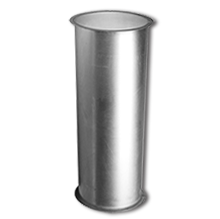 Single and Double-Wall Pressure Industrial Chimney for Heating Appliances, Boiler Breeching, Generator and Fume Exhaust and other applications as defined by standard NFPA 211. PSW products are designed for superior performance and reliability, offering greater versatility in a variety of applications. UL tested and listed for positive pressures up to 60" w.g., and manufactured with a rigid laser welded 304 or 316 stainless steel flue ensuring maximum corrosion resistance. PSW chimney stacks are available in diameters 6"-48" and rated for appliances operating at temperatures up to 1400°F continuous and 1800°F intermittent. 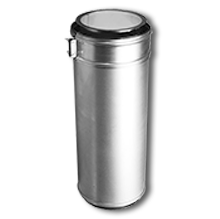 For use with fume exhaust, coffee roasters, water heaters, boilers, generators, turbines and ovens. 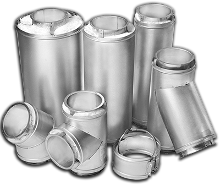 UL tested and listed for positive pressures up to 60" w.g., PIC products feature a rigid 304 or 316 stainless steel flue and optional casing materials to ensure maximum performance and reliability. PIC products are designed with a flanged joint that utilizes a high temperature silicone sealant for quick installation and unmatched sealing strength, reducing cost and installation time. For use with building heating appliances, boilers, fume exhaust, gas turbines, combustion engines, ovens, kilns and solid-fuel burning appliances. 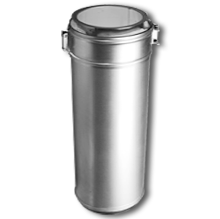 UL tested and listed for positive pressures up to 60" w.g., and manufactured with a durable 304 or 316 stainless steel flue and optional casing materials to ensure maximum performance and corrosion resistance. IPIC products feature a unique 1" ceramic fiber blanket insulation that reduces clearance to combustibles and settling of insulation during transportation and installation. IPIC pressure stack is designed with precision flanged joints that utilize a high temperature silicone sealant for quick installation. 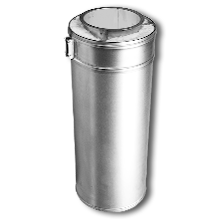 UL tested and listed for positive pressures up to 60" w.g., and manufactured with a durable 304 or 316 stainless steel flue and optional casing materials to ensure maximum performance and corrosion protection. IPIC products feature a unique 2" ceramic fiber blanket insulation that minimizes “hot spots” and reduces settling of insulation during installation and transportation. IPIC pressure stack is designed with precision flanged joints that utilize a high temperature silicone sealant for quick installation and unmatched sealing strength. 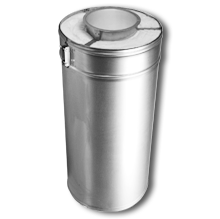 UL tested and listed for positive pressures up to 60" w.g., and manufactured with a durable 304 or 316 stainless steel flue and optional casing materials to ensure maximum performance and corrosion protection. IPIC products feature a unique 4" ceramic fiber blanket insulation that minimizes “hot spots” and reduces settling of insulation during installation and transportation. IPIC pressure stack is designed with precision flanged joints that utilize a high temperature silicone sealant for quick installation and unmatched sealing strength.